File photo The Memphis Belle is slated to open to the public during a special three-day ceremony slated for May 17-19 at the National Museum of the United States Air Force. To gear up for the event, the museum is hosting “Memphis Belle - Dispelling the Myths,” Wednesday, April 18 and Thursday, April 19. WRIGHT-PATTERSON AIR FORCE BASE — With the opening of the new B-17F Memphis Belle exhibit just over a month away, visitors are invited to test their knowledge about the iconic aircraft by attending one of three free presentations titled “Memphis Belle – Dispelling the Myths,” Wednesday, April 18 and Thursday, April 19 at the National Museum of the U.S. Air Force. These programs will be presented by Dr. Harry Friedman of the Memphis Belle Memorial Association (MBMA), and National Museum of the U.S. Air Force Curator Jeff Duford, beginning at 1:30 p.m. April 18 and will repeat beginning 9:30 a.m. and 1:30 p.m. April 19 in the museum’s Carney Auditorium. During the event, Friedman will speak about the Memphis Belle’s missions overseas, its return to the United States and the time the aircraft spent in Memphis, Tenn. Duford will discuss the restoration of the aircraft as well as the planning and construction of the new exhibit. Friedman, a neurosurgeon and author, resides in Memphis, and has had a life-long interest in the Memphis Belle. He has been a member of the MBMA since 1977 and has held multiple positions on the MBMA board including president from 1988-1990. In 2008, he teamed-up with Graham Simons to publish the book “Memphis Belle – Dispelling the Myths,” which they will sign during the exhibit opening events in May. Duford has been a curator at the National Museum of the U.S. Air Force since 1998, and is the lead curator for the Memphis Belle project. He has curated numerous exhibits across the museum, worked closely with the museum’s Restoration Division on more than 60 aircraft projects, and helped develop the aircraft layout and storyline for the museum’s exhibit galleries. The new Memphis Belle exhibit will open with a three-day celebration slated for May 17-19 that will include a WWII-era aircraft static display featuring two B-17G Flying Fortresses; more than 130 WWII reenactors performing war-time skits and showcasing their memorabilia; over 20 vintage military and civilian vehicles on exhibition as well as other artifacts, music from the era, guest speakers, and book signings. In addition, both Memphis Belle films (1944 and 1990 versions) will be shown in the Air Force Museum Theatre. For more information including photos and videos of the Memphis Belle, visit www.nationalmuseum.af.mil/Upcoming/Boeing-B-17F-Memphis-Belle-Exhibit-Opening-May-17-2018/. File photo The Memphis Belle is slated to open to the public during a special three-day ceremony slated for May 17-19 at the National Museum of the United States Air Force. 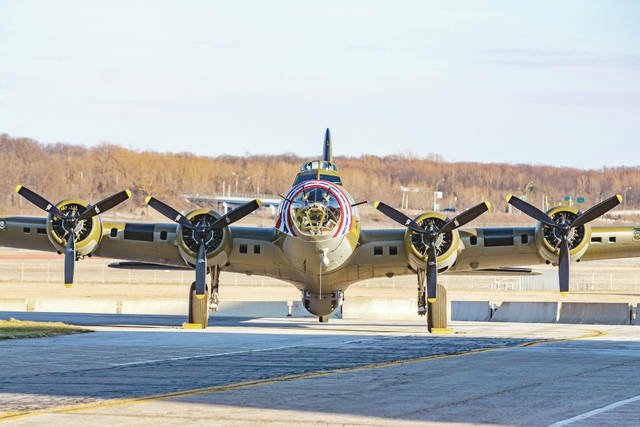 To gear up for the event, the museum is hosting “Memphis Belle – Dispelling the Myths,” Wednesday, April 18 and Thursday, April 19.
https://www.fairborndailyherald.com/wp-content/uploads/sites/50/2018/04/web1_memphisbellemovement7.jpgFile photo The Memphis Belle is slated to open to the public during a special three-day ceremony slated for May 17-19 at the National Museum of the United States Air Force. To gear up for the event, the museum is hosting “Memphis Belle – Dispelling the Myths,” Wednesday, April 18 and Thursday, April 19.